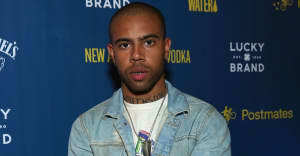 Vic Mensa has been sharing new material regularly this year. He debuted "Danger" during Kanye West's Yeezy Season 3 event at Madison Square Garden. The video for "No Chill," Mensa's collaboration with Skrillex, surfaced not long after. At a benefit for residents of Flint, MI earlier this week, the MC debuted "16 Shots." His latest rapping appears on Towkio's "G W M." The track gives two MCs a chance to talk about their famous friends. I got Vic with me, Towkio raps. That mean Ye with me/ That mean Jay with me/ Kim K with me/ Beyoncé with me/ Team too strong/ Don't play with me. Mensa takes a shot at Spike Lee's Chi-Raq during his verse. "G W M" is co-produced by Mr. Carmack and Kenny Segal. Listen below.